When one of magic's most clever minds teams up with an award-winning magician and illustrator, you know the result will be unique effects that play strong and is so clever that even magicians are fooled. 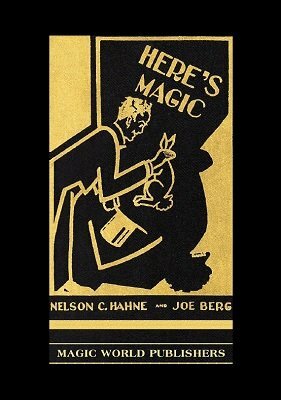 And that's what you get with Hahne and Berg's Here's Magic . There is literally something for every performer within these 96 pages. Effects with cards, coins, silks, a gambler's monte effect using a single matchbook, club magic, a stage illusion that predates Copperfield's Statue of Liberty vanish by some 50 years (but with a similar method), mentalism effects, the award-winning poker chip effect that took first prize in the Linking Ring magazine contest, close-up mysteries, effects for performance at parties and events, and so much more. Where Does the Cigarette Go? 1st edition 1930, 1st digital edition 2017, 96 pages.